hong's blog....: Sino-US ties - 'warmed up' due to Bush? Sino-US ties - 'warmed up' due to Bush? Best-ever China-US ties, a legacy of Bush administration, says envoy. BEIJING: Relations between the United States and China were at their warmest ever, a senior US diplomat said on Thursday as he hailed the improved ties as one of President George W. Bush's important legacies. 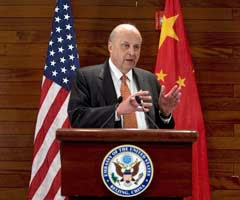 "The United States-China relationship has never been better," Deputy Secretary of State John Negroponte said on the second and final day of a visit to celebrate the establishment of formal bilateral ties on January 1, 1979. The claim was echoed by the Chinese side, with foreign ministry spokesman Qin Gang acknowledging the progress in relations in the past 30 years. "In reviewing the past three decades' achievements, you would naturally draw that conclusion," Qin said in response to Negroponte's statement. Bush entered office eight years ago calling China a "strategic competitor" but analysts said he soon changed his approach, forced by the need to accommodate the emerging Asian giant in the post-September 11 turmoil. Negroponte, the last member of the Bush administration to pay a scheduled visit here before president-elect Barack Obama takes over on January 20, said improved relations were an achievement of the past eight years. "I would venture to predict that when historians look at the record of the Bush administration, surely one of the highlights will be the progress that has been achieved in the United States-China bilateral relationship," he said. The United States switched diplomatic recognition to communist-ruled China 30 years ago, ending decades of support for the Nationalist government of Taiwan. Since then, political and particularly trade ties have grown closer, especially since the end of the Cold War in the early 1990s, although many tensions remain. Continued US military sales to Taiwan, which China firmly opposes, have been the biggest cause of strain. Taiwan and China have been estranged since the Nationalist government of Chiang Kai-shek fled to the island in 1949 after losing a civil war to the communists. Trade also remains a source of tension, with the United States accusing China of unfairly keeping its currency's value low for the benefit of its exporters. Differences over human rights - a sticking point between the two countries during the administration of US president Bill Clinton - also continue to cause problems. And the United States has often voiced concern over China's military build-up. Qin said Negroponte had discussed a wide range of issues with his Chinese counterparts, including anti-terrorism, the development of Africa, and the denuclearisation of North Korea. Negroponte urged the incoming Obama administration to retain collaboration mechanisms set up by Bush, singling out the Strategic Economic Dialogue - twice-yearly high-level economic talks between the two countries. He said his Chinese counterparts had expressed eagerness to deal with Obama and his team. "The government of the People's Republic of China certainly looks forward to working with the next administration and it is eager to undertake dialogue with our new government as soon as possible."